According to Wikipedia, “Imbolc, or Imbolg, also called Brigid’s Day, is a Gaelic traditional festival marking the beginning of Spring. It is held on 1 February, or about halfway between the winter solstice and the spring equinox. Historically, it was widely observed throughout Ireland, Scotland and the Isle of Man.” Here in West Clare it is definitely still celebrated. The celebrations overlap with St Brigid’s day, when people traditionally make Brigid’s Crosses out of rushes. We have several of these crosses around the house, made when our son was at national school and they made them in class each 1 February from rushes cut by the teachers from the nearby fields. Although the meteorological calendar may state that Spring doesn’t start for a while yet, here in West Clare we’re beginning to see signs of Spring’s approach. Being so close to the sea means we rarely get prolonged cold spells (except last winter, which went on FOREVER). This year Winter has been relatively mild so far, hence the picture of the little primrose from my garden, and the daffodils below, which burst into flower this week. Me in my Bogman Beanie! There are colours associate with Imbolc. The main ones are White, Pink, Red, Yellow, Green and Brown. These make total sense – they are so often the colours of Spring flowers, especially green, yellow and pink. I love Spring flowers, their quiet determination to ignore the occasional snow flurry and keep on flowering. Who doesn’t love that amazing spectacle of the dandelions lining the sides of the road all of a sudden, proving a natural road marking and much needed food for the first emerging bumblebees? 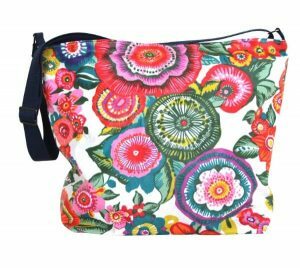 Now of course, my bags are all about flowers, and the colours of Imbolc are really highlighted in my Red Burren and Anemone fabrics particularly. And what better way for me to give you all, my lovely Sallyann’s Handmade Bags followers, a little Imbolc gift. If you go to my shop between now and 14 February, you can enter the discount code IMBOLC and get a 10% discount off your new Sallyann Bag. Go on go on go on. 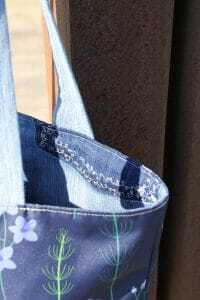 Celebrate the arrival of Spring, clean out your old handbag and bring the colours of Imbolc into your daily routine with one of my mood enhancing handbags, everyone of which is lined with recycled jeans. Chapel Lane Market is taking its Winter break right now, but we hope to be back next month – as soon as I have the re-opening date I will let you know. Previous PostBeat the January Blues with Mood Enhancing Handbags Designed and Made in West Clare! Next PostA Celebration of Spring, Carnaval, International Women’s Day and Sunshine! And a Spring Promotion!